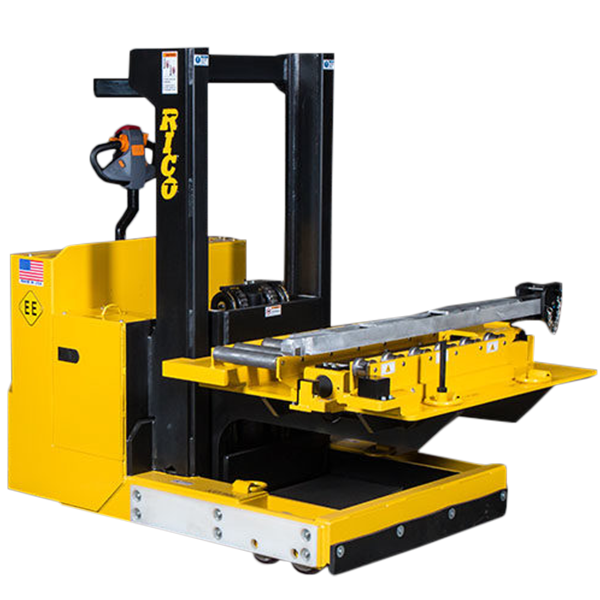 Rico’s Compact die handler offers a safer solution then other traditional lighter die carts. In either a mast or scissor lifting design both offer the same safety, security and reliability as our entire die handing family. All vehicles are custom engineered to meet your specific application and die handling requirements. Tables offered in side or front push options. Scissor lift allows for lower table height without sacrificing lifting requirements. “V” docking system for safe secure truck and press alignment. Fiber optic camera for error proof docking. Die tables offered in bare steel, low profile rollers, brass or nylon wear strips. Pendent controls for precise die transfers. All steel constructed chassis and high strength steel carriage for superior strength. Dual or single vertically mounted helical beveled gear transmissions.